Proper application of electrodes and sensors to the patient is the first step towards ensuring quality sleep recordings. Incorrectly applied sensors and electrodes yield inaccurate data, and can cause excessive artifacts to appear within the recorded tracings. 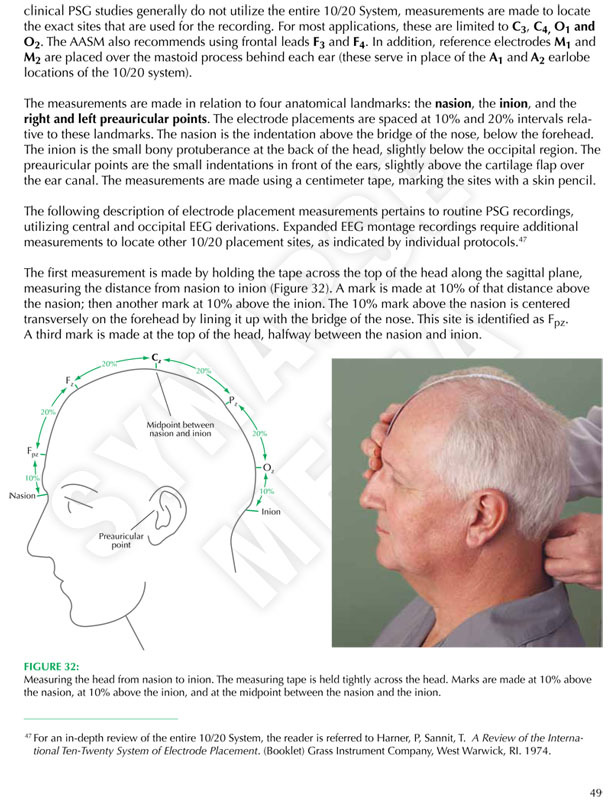 The 2nd Edition of the Atlas of Clinical Polysomnography presents a detailed demonstration of the electrode and sensor application process, including International 10/20 System head measurements, application techniques for EEG, EOG, EMG and ECG electrodes, use of respiratory and oximetry sensors, impedance measurements, and bio-calibrations. Every step of the process is systematically described and illustrated with the use of clear color photographs and diagrams. The Electrode Application chapter also includes comprehensive supporting text with important discussion regarding patient safety and comfort.